'Desert Mirage' OGB (Lois Rich, R. 1988). Seedling R77-121B. AB, 26" (66 cm). Midseason to late bloom. 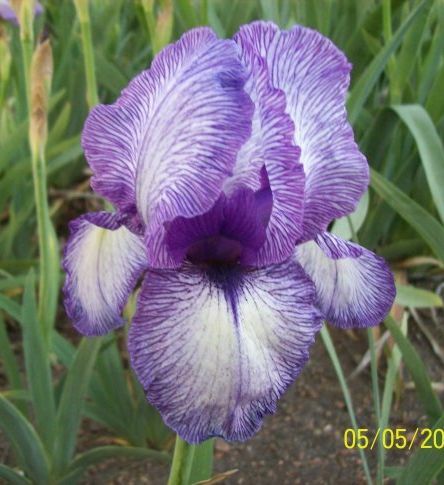 Standards white ground, stitched violet around edge; dark violet beard; violet styles and stigma. 'Mohr Pretender' X (('William Mohr' x CR64-11D) x ('Welcome Reward' x RR64-23A)). Melrose Gardens, 1988.